This study investigated the introduction of Dendrobaena octaedra (a litter-dwelling or epigeic species) in northern Alberta by examining its population genetics. Mitochondrial DNA sequencing revealed that multiple introductions of this species have occurred in this region, although individual populations may have been established by either single or multiple invaders introduced on one or more occasions. 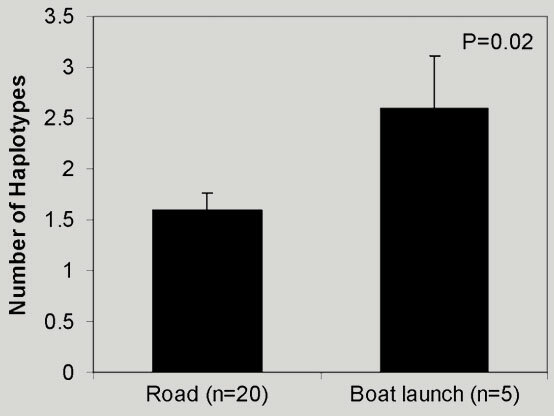 Genetic diversity was higher near boat launches than roads, indicating that multiple introduction events may be more likely to occur at those locations, possibly as a result of bait abandonment by anglers. Average number of haplotypes found at roads versus boat launches.